Easy Brown Bears recipes! Classic camping fare for kids and adults alike. Combine cinnamon and sugar together in a bowl thoroughly. Melt butter in another bowl. Separate biscuits. 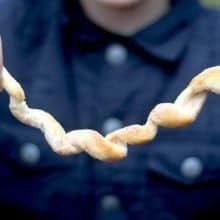 Form each piece of dough into a rope 4 to 5 inches long, making sure not to stretch them out too long. Wrap the dough pieces around proper campfire sticks. We find that patting the dough around the end of the stick to make a "cap" helps the whole piece stay on and not fall off. Hold the sticks over your campfire and slowly turn until the biscuit dough is browned and firm, which takes about 8 to 10 minutes. You can either remove the dough or keep it on the stick when you dip the cooked biscuits into melted butter and then into cinnamon sugar. Eat and enjoy!